1. Mix together the pork and chermoula paste then thread onto metal skewers, alternating with chorizo and red pepper. Cook under a medium grill or barbecue for 15-20 minutes, turning regularly until nicely browned and cooked through. 2. Meanwhile, bring 700ml water to the boil in a large saucepan. Add the stock cube, rice, tomato, saffron and chickpeas. Return to the boil then cover and simmer for 12-15 minutes until the rice is tender and the liquid has been absorbed. Stir in the parsley. 3. 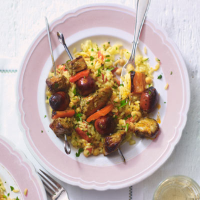 Divide the chickpea rice between plates and serve topped with the grilled meat and peppers. Metal skewers are best for cooking meat as they conduct the heat through the centre of the meat, helping it to cook evenly. Bamboo skewers have a tendency to burn during cooking, but soaking them in warm water for 30 minutes before using will help.